Ziehl-Neelsen Sputum Smear Microscopy (ZN) is one of most common methods for diagnosing Tuberculosis. On the equipment side, it requires not much more than an optical microscope, although it still needs a trained professional to look through the glass, identify and count the number of bacteria in a sample. To provide reliable and effective Tuberculosis diagnostic to regions, where both equipment and trained personnel is in short supply, [Rodrigo Loza] and [khalilnallar] are developing an automated digital microscope based on computer vision and machine learning, their entry for the Hackaday Prize. They started out gathering images of Tuberculosis bacteria from the internet and experimented with color threshold algorithms to detect dyed bacteria, as well as algorithms for counting individual and clusters of bacteria. This process alone can, according to the team, take a trained professional 30 minutes or more. 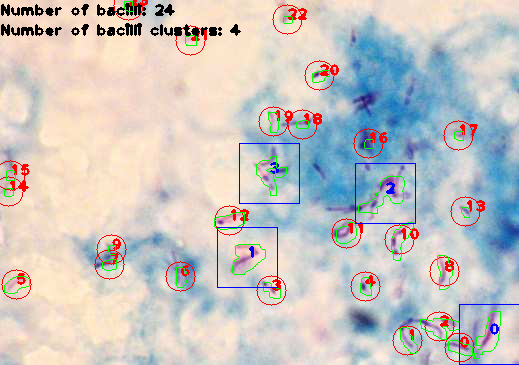 A graphical interface highlights identified bacteria and reads the bacteria count. [Rodrigo Loza] and [khalilnallar] are testing their device at the Dr. Roberto Galindo Teran hospital in Cobija, Bolivia. However, getting access to a lab environment is one thing, and being given access to a steady supply of fresh M. Tuberculosis samples is another. Unable to obtain samples, which they need to test their algorithms on live subjects, they turned to another front of their project: The hardware. In several iterations, they developed a low-cost, 3D-printable kit, which transforms a laboratory-grade optical microscope into an embedded CNC-controlled microscopy platform. Their kit comprises three stepper-motor-based axis for the X, Y and Z direction, as well as a webcam mount. An Intel Edison and a custom, Arduino compatible shield control the system to achieve features such as homing procedures, autofocus and bacteria detection. The team is currently in the process of refining their bacteria detection pipeline, exploring the feasibility of semi-automated detection methods, machine learning and neural networks for classification of bacteria within the hardware constraints. The video below shows their latest update on the Z-axis of their microscope. After what we’re sure is several dozen screw-ups or at the very least a lot of wasted hours, [Chris] has gotten around to building a very precise microscope camera mount for zeroing out his CNC machine. If you need to mill a few bits out of a sheet of metal or plastic, it’s important to know exactly where you’re cutting. A CNC machine can take care of the relative positioning, but if you already have half your holes drilled, you also need absolute positioning. This means placing the work piece exactly where you want to cut, or failing that, zeroing the machine to a predefined point on the piece. [Chris] is accomplishing this with a pen-shaped USB microscope. With a 3D printed mount and a few magnets, this camera can clip right on to the machine, and with the camera interface in Mach3, it’s pretty easy to zero out the mill to within a thousandth of an inch. There’s a video demo of the camera in action below, but there’s a lot more CNC mods on [Chris]’ website. There’s custom 3D printed vacuum nozzles, and a lot of work on a small desktop Grizzly mill. [Amos] sent in the Living Interface. I call it a microscope reactive aquarium. A small light sensitive animal is inside a mini-aquarium on the scope plate. The wires are attached to lights at the edges to attract the animal. The position of the critter is reported via a digital aquarium. (looks like an empty aquarium combined with a projector. Aside from looking friggin cool, it has applications for measuring water toxicity by measuring the reaction time of the animal. 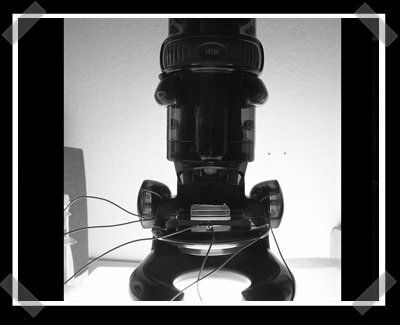 A while back, a friend of a friend supposedly used a USB microscopes to measure yeast activity in his beer brewing. If anyone runs across it, let me know.